Lars is an artist and educator whose interests span the fields of deliberative democracy, international development, and arts education. He currently manages the MIT Public Service Center’s IDEAS Competition and the MIT Global Challenge. 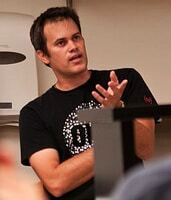 Prior to coming to MIT, Lars worked as the founding research director of the Democracy Lab for Innovation and Research at AmericaSpeaks in Washington, DC. Lars has studied at the University of Southern California, the Corcoran School of Art, and the School for International Training. Thirteen other teams snagged implementation awards to partner with communities on innovative projects overcoming gaps in water/sanitation, agriculture and medical accessibility as part of this year?s MIT IDEAS Competition and the newly launched Global Challenge. This year 45 teams in all competed for $150,000 in awards to fight global challenges. In 2008, the MIT Public Service Center asked: ’What would it look like if we applied that level of problem-solving to the challenges faced by under-served communities, places where markets are failing to provide basic necessities like clean water, health care, or reliable energy?’ The result is the MIT Global Challenge.